Never give up your day dream, it’s not too late to pack up the day job and find your real passion and purpose. 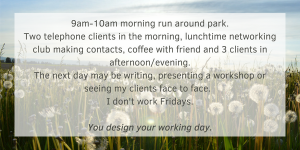 Like you I have endured the psycho bosses, annoying colleagues who book out the prime holiday rota spaces 3 years in advance and the sort of dull routine that makes death by a 1000 paper cuts look like an out onto easy street. In your heart you know there has to be more to life than this. Imagine getting paid for being you and Simon Cowell wasn’t getting a kick back! When you become a life coach you step up into your full potential and help others overcome, transcend and generally shine like the diamonds they were meant to be. And you get paid, for (and with the help of some excellent training, being you. How cool is that? So why train to be a life coach? No more bosses. No more living for lunchtimes and the weekends. You call the shots, you work the hours you want to and no more missing of school plays, family celebrations etc. If you have ever wondered how you “just drifted” into what you are doing you will, at last, find that “coming home” feeling. For the first time you can use your life experiences to benefit others – divorce, overcoming depression or knock backs, traumas, weight loss and health gain, your successes and failures are perfect experiences to help inspire and motivate others. You have always thought you had a special ability to help and support people. You are the natural go-to guy or gal and now you can get paid for it too. No job is for life anymore. If you think you have job security you may be suffering under a delusion and putting your fate in the hands of others. When you work for yourself as a coach you put the hours in, you create your own success and you take control of your life and make it big at last. If you are living for the weekends this is a sign you need to think about quitting your job. Knowing your clients are waiting for your guidance, inspiration, support and coaching tools to support them is the most rewarding position to be in. At last you will not only be valued but also living and working within your own values. Your health will improve. When we do work that doesn’t fit us eventually we pay the price. Migraines, stress, feelings of dread/depression, insomnia, anger and a feeling of futility that you can turn into self blame and disgust “Why am I doing this? If I was any good I would be doing something better. I’m so useless. Is this all there is? I’m stuck here and I didn’t want this for my life” – sound familiar? You never know who you will meet and where your clients will take you in your own personal development. Those seeking to change their lives are real, authentic people who want to get the most out of life. What a privilege to work with them. Being a life coach means you are a catalyst for good and change in the lives of others. This will make you very happy indeed. 10. Work where you want. You coach from your couch, the beach, a café or from your purpose built empire. No more killer commutes. Your work fits in around you. 36 hours of in-person classroom coach training with Carole Ann and top sales and marketing coach Carole Bozkurt. You laugh a lot, maybe cry a little make life long friends on the course. Sign up to my Pure Coaching Academy before August 19th to take advantage of the Early Bird offer – don’t procrastinate make a massive life changing step now! Want to know if it’s the right course for you? Book a call with me to find out.